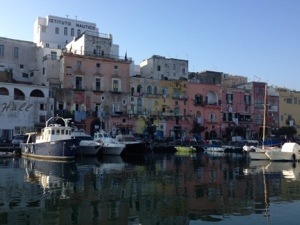 Another glorious but windless morning greeted us on Thursday so we motored over to Procida, an island just outside the Bay of Naples and very close to Ischia. By 1100 the sky had clouded over so sunbathing was out for the first time this holiday! It was around 20nm from Sorrento so we anchored in the Cala di Corricella for lunch. 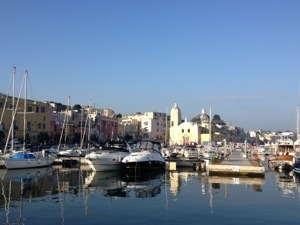 Ingrid, Jan Olav and Liz went off to explore the town of Procida whilst Jo stayed on board to keep an eye on things as we had anchored as close to the breakwaters as we dared but there wasn’t really much room if we dragged at all. After they returned, we then motored round to Chaiolella on the south western corner as there was an anchorage near there but it was very open to the swell and any wash from passing ferries so we continued round to the north side to Marina Grande. For once the marina lived up to its name as it was fairly large, accommodating several hundred boats but without hot showers and decent toilets. 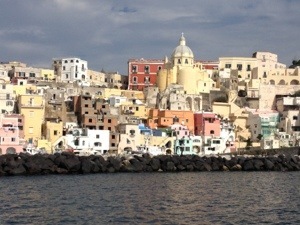 It was, though, very close to the other side of Procida town. We had a lovely meal – about half the price of what we paid in Amalfi and Capri – in a local restaurant that was empty when we arrived around 2030 but busy by the time we left at 2200. 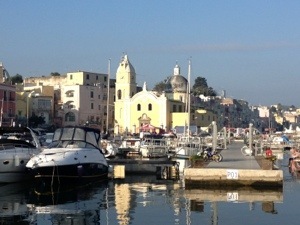 On Friday morning, again the sun shone but no wind to speak of, so we set off in our final leg back to Marina di Stabia. We had arranged for the local boatyard to come to our mooring in the afternoon to quote on replacing all the caulking on our teak deck. It is the black silicone sealant that seals the gap between the strips of teak. Over the course of the summer it had turned to something akin to tar in that it had started to melt and getting very messy. We have yet to see what the quote will be. After refuelling the boat for the winter (as it stops condensation forming in the fuel tank) and mooring Nimrod in her new berth, we did a few jobs to prepare her for the winter. We then decided to try a local restaurant that was only a stone’s throw for the marina but is a 15 minute walk away because of the railway track. The restaurant is obviously well known locally and we were the only tourists in there. 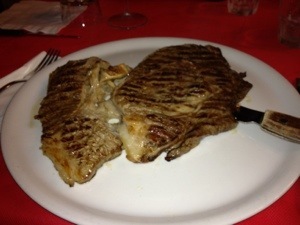 We had huge slabs of steak with a very nice but relatively cheap bottle of wine. Jan Olav had a pizza and a large beer – his portion of the bill came to less than €10! On the way out Ingrid asked for their takeaway menu but they misunderstood and provided us with a driver back to the marina! Pictures below of lunch stop looking at the south side of Procida, Procida marina and one of the steaks we had last night! This entry was posted in News and tagged 2013, Italy, Med. Bookmark the permalink.